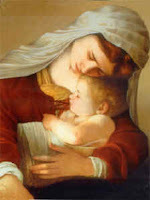 What would Mary say if you asked her which one of all the titles she has been given her by God, was the one she liked best? Would she say, I like to be called Virgin of Virgins or Health of the Sick or Mystical Rose? Certainly her greatest title is Mother of God and this was given her by the early Church almost from the beginning. Fortunately, a fragment of papyrus has been found which reveals the existence in Egypt, from the third or, at the latest the fourth century, of the antiphon We fly to your protection, O holy Mother of God. But actually, we don’t have to wonder what Mary would call herself because she has already answered the question for us. Holy Scripture records, as far as I know, only one title Mary ever gave herself while on earth. She told the archangel Gabriel, at the time of the Annunciation, I am the handmaid of the Lord. A loving tribute to Mary, expressed as ever,with originality and giving us food for thought and nourishment for our own devotion. Thank you, Father John. Loved the picture.